The head and tail length of the Wallaroo ranges from 43 to 78 inches, and the weight from 14 to 103 pounds. Coloration is dark gray to reddish above, and paler below. The fur is shaggy, coarse, and varies somewhat among the subspecies. The rhinarium (area of naked skin around the nostrils) is black. The stance is distinctive: shoulders thrown back, elbows tucked into the sides and wrists raised. There is marked sexual dimorphism: mature males attain twice the weight of mature females and are usually darker in color. 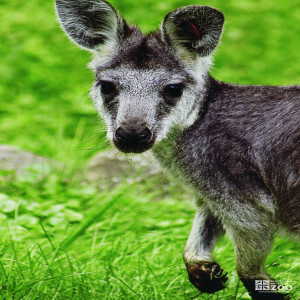 The range of the wallaroo is Australia. Wallaroos inhabit steep escarpments, rocky hills, where caves, overhangs, etc. provide shelter. The wallaroo is essentially solitary. No long-term studies of population dynamics have been done, but it appears that the density of populations is governed both by the amount of available shelter and by proximity to food and water. Seasonal conditions, competition from other animals, and human predation may reduce populations to less than the apparent carrying capacity of an area. Densities as high as 13 per square kilometer have been recorded, and after a population crash, as low as .04 per square kilometer. Breeding in wallaroos may occur throughout the year but reproduction is reduced in time of drought and may cease if drought is prolonged. Estrus cycle is about 33 days. Sexual maturity is attained at 18 to 24 months. Gestation is about 32 days, followed by a pouch-life of about 260 days.